Pity poor Martin Van Buren: reviled in life, ignored in death, undistinguished enough that biographers have had a hard time finding much to say about him. Until now. Clinton administration advisor Widmer (Young America, 1999) reckons that Van Buren will always be considered one of our lesser leaders: “His presidency [1837–41] produced no lasting monument of social legislation, sustained several disastrous reversals, and ended with ignominious defeat after one short term.” Van Buren is unknown today, Widmer adds, mostly because no one is looking for him, a lost figure in the years between the War of 1812 and the Civil War. 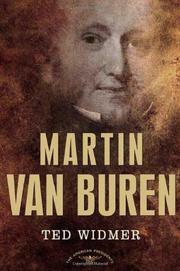 He was well known in his day, however, and even though always something of an outsider, the first of the non-Anglo presidents, a native speaker of Dutch and of humble origins, Van Buren forged a new Democratic Party made up of southern planters, New York financiers, and New England industrialists alike. Such a broad constituency, however, forced the president into many compromises: Though he didn’t quite oppose slavery, for instance, he quietly supported certain civil rights for African-Americans. (Too quietly, it appears: In 1839, he issued an executive order demanding the return of rebellious slaves to their Spanish owners, an act making him a villain in Steven Spielberg’s film Amistad.) As a result, both northern abolitionists and southern slaveholders came to mistrust Van Buren, who, Widmer insists, had other virtues: He refused to invade Texas, championed the cause of the urban poor, and advanced ideas that would cause historian Frederick Jackson Turner to consider him an architect of progressivism. Yet Van Buren also presided over the ruinous Panic of 1837, and he failed to push through his pet reform—to create an independent treasury. Though crafty and diligent, in the end not even the seasoned politician dubbed the “The Fox” could weather all the storms that sank his administration. Well written and sensible—especially when Widmer notes that “it’s antidemocratic to expect all of our leaders to be great.” Q.E.D.